I hear it when I’m seated at my desk. It’s quiet, with light footsteps treading through industrial carpet; clothing shuffling; a hushed collection of people slowly approaching from behind. The voice is almost always that of a WXIA-TV staffer, standing directly behind my head. Sometimes the voice presents the room matter-of-factly. Sometimes there’s a hint of ginned-up wonderment. To me, it’s “only” a TV newsroom, a place I’ve spent my professional life. To its visitors, touring a TV station, it’s a highlight. For any tour group entering our newsroom, my desk is pretty much the first thing they see. Often the words “hard at work” are also used during this section. By this time, I’ve usually figured out that there are countless eyeballs behind my head. I’ve closed Facebook and am resisting the temptation to grab my land-line phone, light a cigarette and stage-voice some sort of crackling monologue: Gimme the mayor. No, I need to talk to him right now. Right now! It’s very, very important. 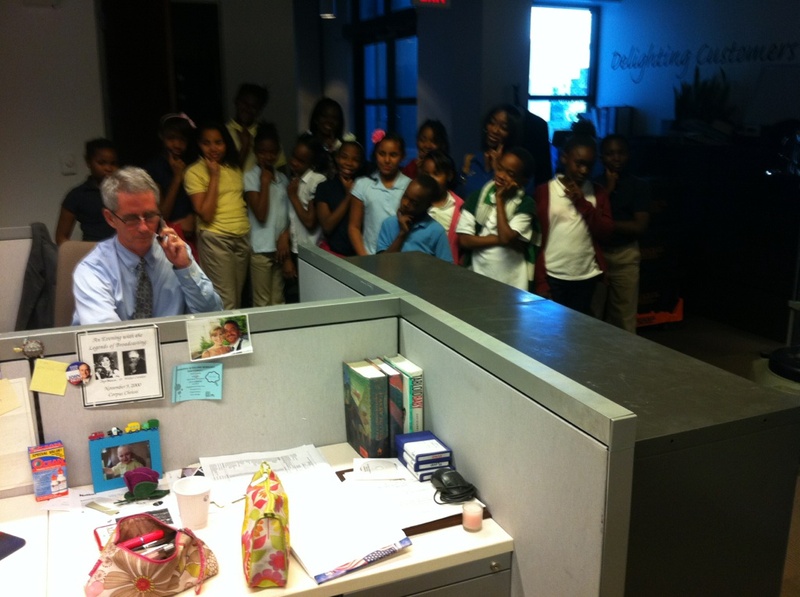 It’s too bad Bill Liss’s desk isn’t at the newsroom entrance, coz they’d actually hear that. Liss is straight out of a Damon Runyon script, minus the cigarette smoke. Most of our reporters are already out covering stories…. When I turn to say hello, the 11Alive staffer giving the tour is always visibly grateful. She’s starting to run out of material pretty quickly. 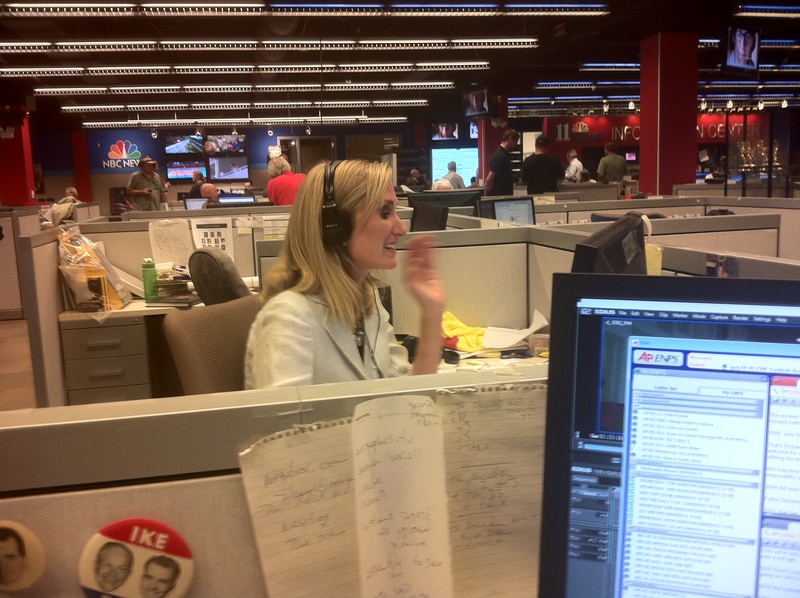 What tour groups see: TV’s Jaye Watson holds down the fort between my desk and the rest of the newsroom. Though my desk is rather nightmarish to behold, I’ve posted a bunch of vintage political buttons on the board above my phone. I’ve done this specifically to add some character to the desk, mostly for the benefit of the strangers shuffling up in groups. From my desk, the view of the newsroom is expansive. The newsroom has no cubicles, so I have a line-of-sight on just about everybody and everything in the room. To the extent that there’s anything worth seeing, you can see it from my desk. 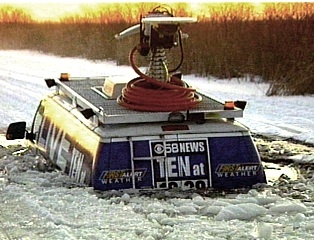 You can see, we use state of the art equipment to produce stories for TV and our web site, 11alive dot com…. This line is frequently reserved for “official” tours, when the visitor needs to be impressed. I’ve learned to suppress any snickers; our newsroom, like many others, is famously not state-of-the-art. Much of the gear is new, however, albeit purchased by bargain hunters who know better than to pay top dollar for overrated state-of-the-art crapola. The tour group photographed above showed up at about 10:30am one day. Within a few minutes, a very suppressed wave of low-grade panic crossed the newsroom; the server that plays all our on-air video and graphics had crashed. The noon newscast was in grave danger. The tour group had moved on to the studio at this point, which was mostly empty. “Put ’em in the control room at noon,” I remember thinking, before the server came back to life. Now that would have been something to see. This entry was posted in WXIA on October 28, 2012 by live apt fire.